Sweet Deal in Suites: Get 15% Off!! 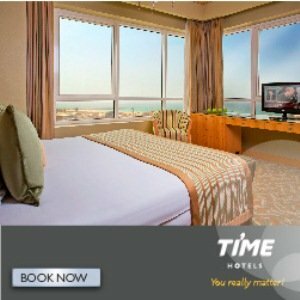 Sweet Deal in Suites: Get 15% Off in Suite Rate Time Hotels, Dubai, UAE. Book your Suite and enjoy a discount of 15% on your suite rate at the Time Grand Plaza Hotel, Al Qusais and at Time Ruby Hotel Apartments, Sharjah. Offer includes: Free Upgrade to Sea View 1 bedroom at Time Ruby Hotel Apartments with a 15% discount on all incidental charges applied. T&C: Period of booking and stay: Now until 31st December 2015. Offer valid for Time Grand Plaza hotel and Time Ruby Hotel Apartments. Book Now. Get 10% Off at Selected Hotels with Hotelclub UK & USA!! Get 10% Off at Selected Hotels with Hotelclub UK & USA. Get the discount of 10% from Hotel Club in selected hotels valid for UK and USA market. T&C: Booking period From Now to 30th June 2015. Period of stay From Now to 30th June 2015. Use promo code: ARED10. Stay & Drive with Time Hotels!! Stay & Drive with Time Hotels. Enjoy a free car with every night you stay with us be it on short or long term stay at our Hotels and Hotel Apartments. For every night you stay at either our Hotels or Hotel Apartments, we are offering a free rental car in partnership with Hertz. Book Now. TIME Oak Hotel & Suites Al Barsha, Dubai. TIME Oak Hotel & Suites Al Barsha, Dubai. For a short business trip, an extended stay assignment, or just a weekend in exciting Dubai, the hotel is conveniently located in the Tecom area, facing Internet City and Media City. The hotel has non smoking floors available at your request. One door away from the Dubai Internet City metro station - Red Line #34. Just 5 minutes away from Mall of the Emirates, and 10 minutes drive to Ibn Battuta Mall. A 15 minute drive to the Jebel Ali Fee Zone and the new Al Maktoum International Airport. Only 30 minutes from Dubai International Airport. TIME Grand Plaza Hotel!! TIME Grand Plaza Hotel features 232 spacious rooms and suites appointed with every imaginable guest comfort. Savour superb cuisine at two onsite restaurants and a breezy poolside lounge. Enjoy an invigorating workout in the state of the art Powerzone fitness centre or soothe away stress in the temperature controlled rooftop pool. High speed Wi Fi Internet access. Two Crew Lounges. 24 hour in room dining. 24 hour fitness centre. Shuttles to the malls. Shuttle to the beach. Ladies Beauty Salon. Gentlemans Salon. Steam Room & Sauna. Book Now. TIME Grand Plaza Hotel. TIME Grand Plaza Hotel features 232 spacious rooms and suites appointed with every imaginable guest comfort. Savour superb cuisine at two onsite restaurants and a breezy poolside lounge. Enjoy an invigorating workout in the state of the art Powerzone fitness centre or soothe away stress in the temperature controlled rooftop pool. High speed Wi Fi Internet access. Two Crew Lounges. 24 hour in room dining. 24 hour fitness centre. Shuttles to the malls. Shuttle to the beach. Ladies Beauty Salon. Gentlemans Salon. Steam Room & Sauna. Half Board Escape Package. Enjoy our exceptional half board rates during your stayIn TIME Grand Plaza hotel and TIME Oak Hotel & Suites. Sweet Deal in Suites. Book your Suite and enjoy a discount of 15% on your suite rate at the TIME Grand Plaza Hotel and at TIME Ruby Hotel Apartments in Sharjah. Free Upgrade to Sea View 1 bedroom at TIME Ruby Hotel Apartments with a 15% discount on all incidental charges applied. Time Senior Discount TIME Renero Resort & Suites Azzurra. Time Senior Discount TIME Renero Resort & Suites Azzurra. If you are 60 years and above, you can save at least 15% on your room rate at TIME Renero Resort & Suite Azzurra with an additional 10% discount on all incidental charges. Themed Nights - Time Hotels!! Themed Nights - Time Hotels!! TIME Hotels introduces delightful Themed Nights. Drop by our restaurants today and enjoy great food in even better ambiance. Oriental Night at Petals: Be enchanted by the magic of Oriental Cuisine and let the flavors transport you to a wonderful land; It is an experience that cannot be missed. Spa and Fitness Offer!! Treat yourself with an ultimate spa journey. Awaken your senses within awe inspiring and relaxing surroundings. Enjoy memorable experience in tranquil place of serenity,opulence and pure indulgence. Only at TIME Grand Plaza Hotel in Al Qusais. Time to Save - Get 10% Discount!! Time to Save - Get 10% Discount. Select one of our Pre paid rates and receive 10% off the best available rate. Terms & Conditions: Full payment required at time of booking. Non refundable or transferable. The TIME to SHOP package is the ideal package for a variety of special occasions whether its a family weekend, girls day out, a mother daughter bonding trip or a guys weekend away. This package includes: Free shuttle service. Complimentary daily fruit basket. Local newspapers. Time to Save - Get 10% Discount!! Select one of our Pre paid rates and receive 10% off the best available rate. Terms & Conditions: Full payment required at time of booking. Non refundable or transferable. Book Now. Stay For 3 And Pay For 2!! Stay For 3 And Pay For 2!! Get three nights for the price of two. Come to Dubai from May to September and experience the summer full of surprises and the magic of Ramadan. Witness the city come alive after sunset during this auspicious month and have the most comfortable and relaxing stay. T&C: Valid for Bookings and stays made till the end of August 2014. Black out Dates: 29th July till the 8th August 2014. Valid for: TIME Oak Hotel & Suites and TIME Crystal Hotel Apartments. TIME Grand Plaza Hotel. TIME Opal and Time Topaz Hotel Apartments. TIME Ruby Hotel Apartments. Book Now. Stay For 5 And Pay For 3!! Stay For 5 And Pay For 3!! Get five nights for the price of three. Come to Dubai from May to September and experience the summer full of surprises and the magic of Ramadan. Witness the city come alive after sunset during this auspicious month and have the most comfortable and relaxing stay. T&C: Valid for Bookings and stays made till the end of August 2014. Black out Dates: 29th July till the 8th August 2014. Valid for: TIME Oak Hotel & Suites and TIME Crystal Hotel Apartments. TIME Grand Plaza Hotel. TIME Opal and Time Topaz Hotel Apartments. TIME Ruby Hotel Apartments. Book Now. Valentines Special. Valentines Day is the perfect time to inspire people to connect with their loved ones. This Valentines Day will be something you will not forget with that special TIME Hotels touch. Book a rendezvous between February 12 and February 16, 2014 and enjoy a romantic getaway from TIME Hotels that includes: 20% discount on a Romantic Valentines dinner on 14th of February. Deluxe Accommodation. Guaranteed Late check out. Floral & Chocolate arrangement. Daily Turn Down service. Two Valentines mocktails. 20% off massage only available at TIME Grand Plaza Hotel. Early Bird Promotion!! Book 20 days in advance and get 15% discount. It is valid for all of our properties and Food & Beverages and spa/fitness discounts are available at Oak and Plaza. Free In room internet access. Complimentary usage of Fitness Center & Swimming pool. 25% Discount for food all outlets Oak & Plaza. 25% Discount for spa Oak & Plaza. Time Boutique! Everyday lifestyle accessories for you. Dressing down after a hard day's work does not have to be a compromise. Grab yourself a polo shirt and couple it one of our caps, the perfect match for a casual sunny day. Time to Shop!! The "TIME to SHOP" package is the ideal package for a variety of special occasions whether it’s a family weekend, girls' day out, a mother/daughter-bonding trip or a guy’s weekend away. You will receive fruit basket and newspapers in the morning. We will give you a ride to Mall of Emirates and let you spend the whole day satisfying your shopping crave. After a long day you can relax next to our pool and enjoy great food at one of our dining venues. This package includes: Free shuttle service. Complimentary daily fruit basket. Local newspapers. Time for a Splash!! Plan your holiday with TIME and make a splash at Wild Wadi Water Park - ‘the only themed’ amusement park in UAE, featuring over 30 attractions and adrenaline pumping rides for all ages. Package includes: Accommodation. Full buffet breakfast. 2 tickets to Wild Wadi Water Park and complimentary transport to Wild Wadi. Excludes 10% Service Charge & 10% Municipality Fee. Book Now. Shisha Special!! Enjoy exotic feeling of Shisha with the most exquisite selection of dishes at TIME Oak Hotel and Suites. Immense yourself in a Saynia dish and share it with your loved one. Special Limited Time offer for Shisha: Only 35 AED per person. Time to Cruise!! Stay with TIME and enjoy a Dhow Cruise experience truly Bedouin Style. Hop aboard and enjoy a memorable evening, where the height of opulence combines with a heart warming sense of Bedouin tradition. Rate includes: Accommodation. Breakfast and 2 Dhow Cruise tickets which includes two hours Dhow cruising, continental & Arabic buffet dinner, soft drink, tea and coffee refreshments. On board music. Air conditioned lower deck breezy open air upper deck. Spa and Fitness Offer!! Treat yourself with an ultimate spa journey. Awaken your senses within awe inspiring and relaxing surroundings. Enjoy memorable experience in tranquil place of serenity,opulence and pure indulgence. Only at TIME Grand Plaza Hotel in Al Qusais. Terms and Conditions apply. Time for a Thrill. Desert Adventure. Watch the magnificent sunset across the dunes before arriving at the desert campsite where a welcome Arabic coffee & tea awaits with unlimited soft drinks. Rate includes: Accommodation. Breakfast. 2 adult tickets to Desert Safari a true Arabian experience with an assurance of scenic nature and starlit nights. Tickets include pick up and drop off at the hotel, desert driving & dune bashing in 4x4s by professional drivers trained in Dubai desert driving and sand boarding. Welcome to the fresh and bright world of TIME Hotels, an innovative new company with a dynamic vision to transform the Dubai hotel landscape for extended stays and short-term travel, business or pleasure. Through our superb collection of Dubai hotels and serviced apartments, TIME brings a refreshing approach to the standard upscale lodging experience with energetic, hands-on leadership and proactive but always respectful service. Superb Hotels and Serviced Apartments For Extended Stays, Short Trips, and Weekend Escapes. We commit to provide a unique hotel accommodation experience through our dedicated team and our modern collection of four and five-star hotels and serviced apartments, blended with Middle Eastern Hospitality.